Hosseinzadeh, Z., Farhoomand, P., Najafi, R. (2014). Effects of Tarragon Powders’ Different Levels (Artemisia Dracunculus) on Performance and Carcasses ‘Characteristics Male Broiler Chickens. International Journal of Advanced Biological and Biomedical Research, 2(5), 1750-1760. Zahra Hosseinzadeh; Parviz Farhoomand; Ramin Najafi. "Effects of Tarragon Powders’ Different Levels (Artemisia Dracunculus) on Performance and Carcasses ‘Characteristics Male Broiler Chickens". 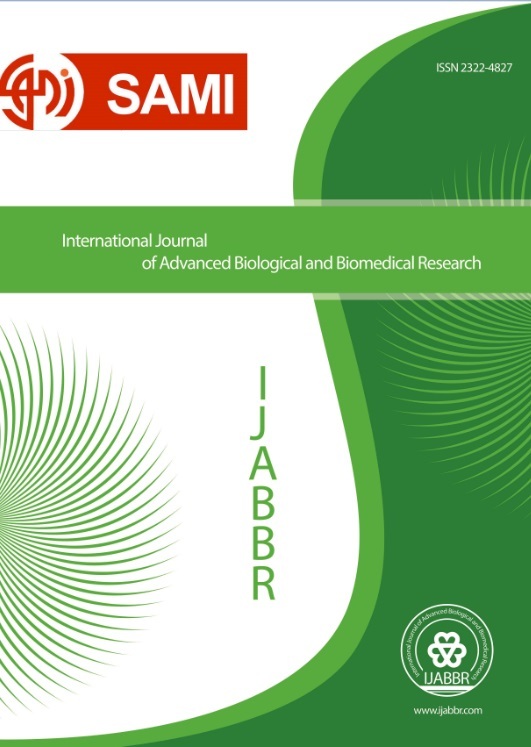 International Journal of Advanced Biological and Biomedical Research, 2, 5, 2014, 1750-1760. Hosseinzadeh, Z., Farhoomand, P., Najafi, R. (2014). 'Effects of Tarragon Powders’ Different Levels (Artemisia Dracunculus) on Performance and Carcasses ‘Characteristics Male Broiler Chickens', International Journal of Advanced Biological and Biomedical Research, 2(5), pp. 1750-1760. Hosseinzadeh, Z., Farhoomand, P., Najafi, R. Effects of Tarragon Powders’ Different Levels (Artemisia Dracunculus) on Performance and Carcasses ‘Characteristics Male Broiler Chickens. International Journal of Advanced Biological and Biomedical Research, 2014; 2(5): 1750-1760. This study was designed to investigate the effects of different levels of Tarragon powder on performance and carcass’ characteristics of broiler chickens. 200 one-day-old Ross 308 male broiler chickens in a completely randomized design with 4 treatments and 5 replicates per treatment and 10 birds in each replicate were used. Experimental diets were set on the basis of corn-soy-wheat and Ross 308 broiler chickens nutritional requirements tables by the use of UFFDA ration formulation software for each of the (1-21 days) and (22-42 days) period. Treatments were: base diet (control), base diet + 0.125% of Tarragon powder, base diet + 0.25% of Tarragon powder, base diet + 0.5% of Tarragon powder.The results of experiment showed that experimental dietaries caused no significant difference between the Feed Intake of different treatments statistically (P>0.05). The consumption of experimental rations increased body weight in control treatment and 0.125% Tarragon treatment when compared with powder 0.5%Tarragon powder treatments in 1-21 days old (P<0.01). It also decreased the body weight in 0.5%Tarragon powder treatment when compared with control treatment significantly in 1-42 days old (P<0.05). The consumption of experimental rations caused significant increasing of 0.5%Tarragon powder treatment’s Feed conversion ratio when compared with control treatment and 0.125% Tarragon powder treatment in 1-21 days old (P<0.05) as well as in 1-42 days old (P<0.01).The consumption of experimental rations caused significant decrease of 0.5%Tarragon powder treatments’ production efficiency index when compared with control treatment and 0.125% Tarragon powder in 1-42 days old (P<0.01). The consumption of experimental rations caused significant increase of 0.5%Tarragon powder treatment Mortality rate when compared with control treatment and 0.125% Tarragon powder in 1-42 days old (P<0.01). The consumption of experimental rations had no significant effect on the relative weight of breast, thigh, cookable carcasses and abdominal fat of different treatments in the whole process of husbandry in 1-42 days old (p>0.05). It seems that adding Artemisia dracunculus (Tarragon) powder 0.5%level to the broiler chicken’s rations can decrease the body weight when compared with the body weight of other treatments; accordingly this can lead to significant increase of this treatment’s feed ratio conversion when compared with other treatments.